Dr. Steven Leigh, assistant professor of biomechanics at Marshall University, teaches students about force and balance. Leigh and Dr. Suzanne Konz traveled to New Haven Elementary to present their “Biomechanics Roadshow” to students. This students tosses a wiffle ball while Dr. Suzanne Konz, program director for Biomechanics at Marshall University, measures the speed with a radar gun. 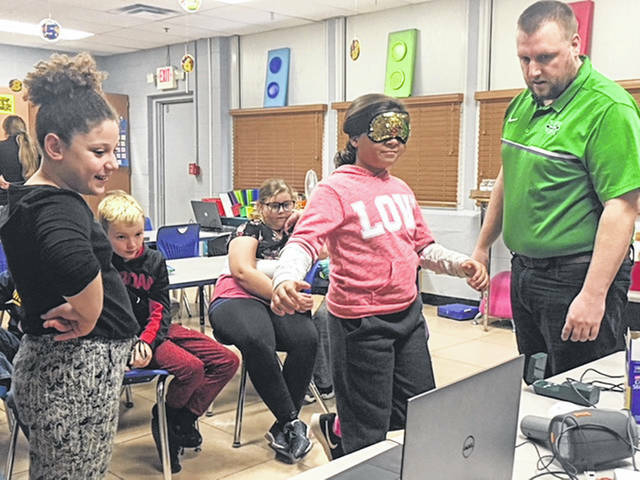 NEW HAVEN — Professors from Marshall University’s Biomechanics program visited New Haven Elementary on Friday with their “Biomechanics Roadshow” in an effort to expose students to biomechanics, Marshall and careers in STEM-related fields. STEM stands for Science, Technology, Engineering and Math. MU’s Biomechanics program recently received a Governor’s STEM Mini-Grant, dispersed through the Office of Secretary of Education and the Arts in West Virginia to provide for some of the equipment in the roadshow. 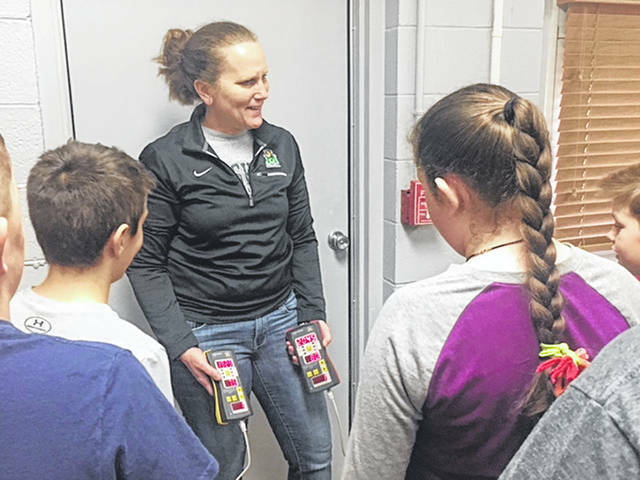 Arriving to meet Kira Northup’s fifth grade science students were Dr. Suzanne Konz, associate professor and program director of Biomechanics at Marshall, and Dr. Steven Leigh, assistant professor of Marshall University Biomechanics. Konz and Leigh engaged the students with several stations of STEM-based learning. There was the force plate station where students could jump off the plate to see how much force they could generate at takeoff. A motion sensor detected the students’ movements when they stood on a foam pad to generate the data, at times standing on one leg and blindfolded. This showed the connection between visualization and balance which included an anatomy lesson and a lesson in physics as it pertained to stable and unstable surfaces. Students also were treated to a radar gun measuring the speed of a wiffle ball being throw at Dr. Leigh and were able to jump into cornstarch to demonstrate measuring foot type and gait, which literally left an imprint on the floor…albeit temporary. Students were then exposed to a Tendo FitroDyne device which analyzed velocity, force and power by attaching the device to their belt loops and doing a vertical jump. Finally students were video taped while in motion and that footage was analyzed by a specialized analysis software, allowing the professors to determine joint angles, as well as calculate timing and measurements pertaining to how fast a body is moving. Using a gonimoneter was discussed when manually measuring joint angles on the body and counting the number of frames on a camera were other ways to calculate speed. 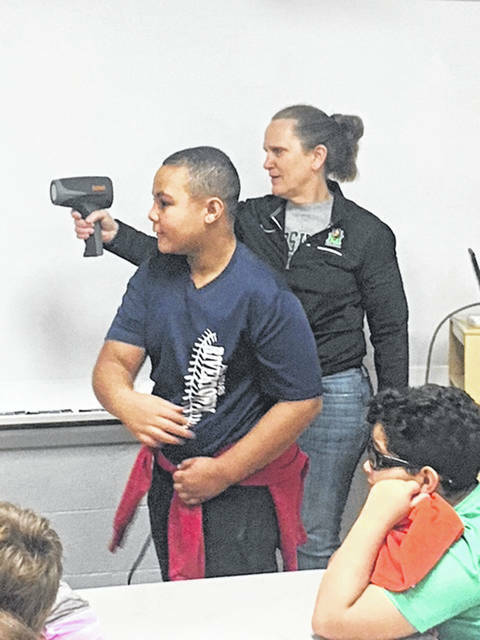 Konz said she was impressed with the students’ willingness to participate and ask questions – one of those questions coming from a student who asked if she’d be at Marshall in 10 years when he attends. The roadshow next travels to St. Joe’s in Huntington but both Konz and Leigh say they are willing to travel to other area schools in West Virginia, Ohio and Kentucky as their schedule permits. They hope to do one roadshow a month, schedules permitting, and New Haven just happened to be first on the inaugural tour. That program can also be tailored for students from elementary school through high school. One important aspect of the roadshow for Konz is to show young girls they too can have careers in a STEM-based profession, just as she does.